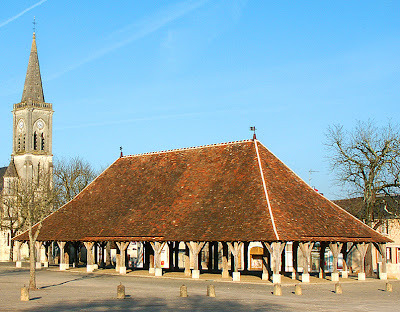 I have posted this picture just to show what the tower on the church at Preuilly used to be like. It was just a plain simple "Romaine" tower before it fell down at the end of the 19th century, to be replaced with the polychrome monstrosity that now graces it. 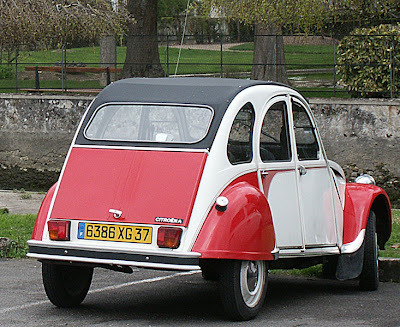 The Citroën 2CV, a French design classic. Designed in 1939 and in production from 1948 to 1990, it was capable of being driven across a plowed field without breaking any eggs in a basket on the front seat. 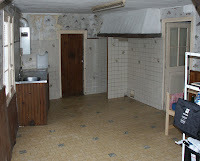 I have just returned from 5 days in Preuilly on my own. Rouen is quite possibly a pretty town. 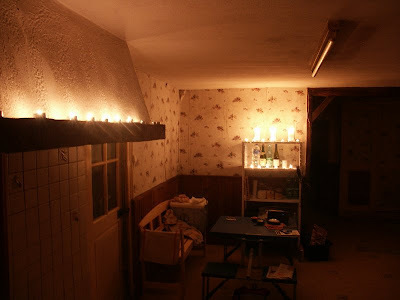 I hope the residents of Rouen like it, and can find their way around. I can't. I was so lost on Wednesday evening that I was beginning to doubt my own existence. The big problem as a tourist is that any map you buy or print shows road names. The street signs all point to places not shown on your map, but the street names are on metal plaques high up on building walls, and apparently painted over in 1935. This make navigating whilst driving nigh on impossible. I went around one roundabout 8 times. Once I went around it twice in succession, trying to work out which exit it was I had decided to take. 90 minutes later I was still lost. Then, heading the wrong way, I passed my hotel. This meant finding somewhere to turn around (almost impossible in a town that has trams). Still - I was only an hour late for dinner. 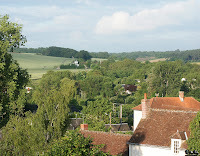 After dinner, I got (almost inevitably) lost again, heading towards Dieppe before finding somewhere to turn around. After a 4 hour drive the next day I arrived at the house in Preuilly. As soon as I arrived I decided I wasn't going to be staying the night. Even though it was midday I could see my own breath, and as I was recovering from a cold the chances of developing pneumonia seemed fairly high. Thus I booked into the Hotel L'Image for two nights. After doing that I went back to the house and started work. I had taken a radio with me, so listening to the World Cup of Cricket on BBC Radio 4 Longwave I started to clean. This was the story for the next 3 days. 30 years of being uninhabited and uncleaned meant that just cleaning the surfaces was not enough. 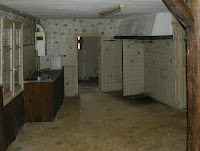 Everything had to be scrubbed a number of times, as well as treated with bleach. As we do not have running water yet I had to keep taking trips to the sports field to fill the 20 litre water bottle, which was not as much an inconvenience as it could have been, as the sports field also has a public toilet. As well as cleaning the kitchen I called into Bertucelli the plumbers to drop off the signed contract and find out when the work can be done. Although "yesterday" wasn't an option, after explaning that "Je n'ai pas une toilette" the urgency was understood and we agreed that the work would be done before Susan and I return at the end of next week. No more trips to the sports field then!! To save on money I had bought a pair of small gas camping stoves, so I was able to use the kitchen for it's proper purpose. This was quite exciting, cooking and eating the first meal in the new house - even though by 7.00pm it was bitterly cold. By candlelight most of the blemishes of the years of neglect are blurred out and it looks like a real home. 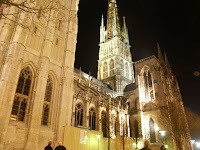 I left Preuilly at 8.30 on Monday morning, pausing only in Rouen (to get lost - as is now traditional - looking for fuel) and arriving in Boulogne in time to do some shopping before heading to Calais for the ferry. Whilst shopping I discovered "Nectar de Rhubarbe" made by Les Vergers de la Feuille. It's a traditionally made, 1% alcohol, sparkling rhubarb wine, just perfect for lunchtimes. I have a feeling that if we can buy it locally it will become a staple. 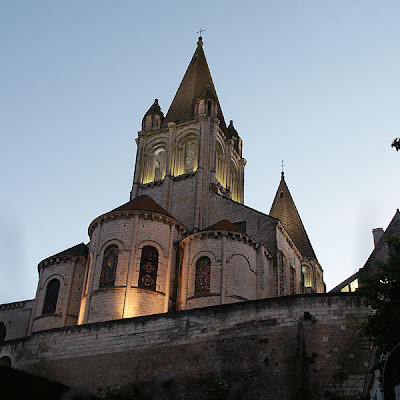 This is the parish church of St-Ours, formerly the collegiate church of Our Lady. 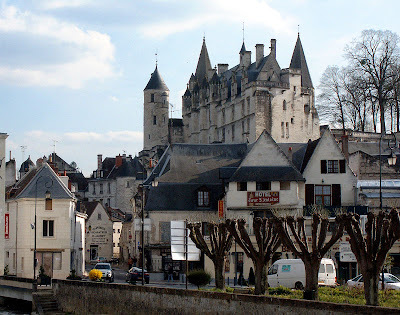 It was started in the 10th century and stands inside the old city walls of Loches. The church has an amzing polychrome roman gate - a painted archway to most of us - dating from around the time of the original build. Agnes Sorel (mistress of King Charles VII of France)is buried here. This photo was taken on a beautiful warm May evening while we were watching the swallows and bats catching insects on the terraces leading to the old city. We have been asked this question a number of times; parents, friends and stranger all want to know why a pair of Australians would move to London, and then 10 years later decide to move to France. I can't answer for Susan (I wouldn't be so bold), but the easy - and slightly trite - answer is "why not". We decided that we didn't want to be renting a house for ever in London, but we knew we could never afford to buy here without a massive mortgage. The trouble with mortgages is that they have to be paid back, and neither of us wants to be working for ever just to provide a roof over our heads. When we bought our houses in Australia, mortgage rates were over 16%, and the thought of exposing ourselves to that sort of stress was just too much. We started our house hunt looking at places in the rest of England, but it quickly became obvious that no matter where we looked to buy here would involve a mortgage. We were considering Wales until we realised that we speak more French (in my case 2 words, in Susan's case quite a bit) than we do Welsh (none whatsoever), and we didnt want to be foreigners living in an enclave all our lives. We knew we wanted a garden where we could grow a lot of our own food, and do some sort of tourism based income generation. 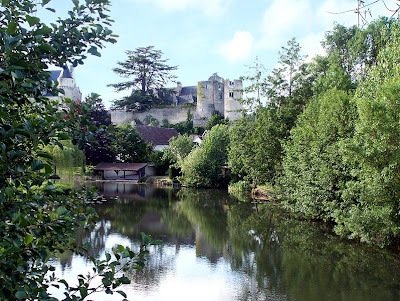 I am not sure why we decided on central France, but all the properties we looked at seriously were in a band roughly following the Loire Valley. The closeness to airports with links back to London was a factor. The overriding consideration, though, was that we liked it first time we visited. 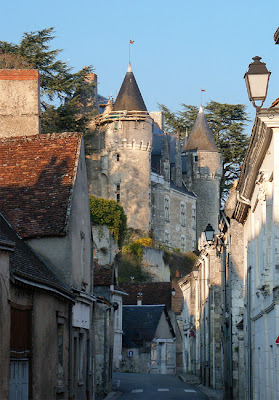 It isn't an area you hear a lot of in the ex-pat press, but "the Loire Valley" has a ring about it. It has a really varied landscape (the only element missing being proper mountains), the big chateaux, working countryside, and Susan was excited by a couple of birdwatching reports she read about the Brenne Regional Natural Park. Add on to that the fact we have found a house that appeals, and I think we have found our new home. 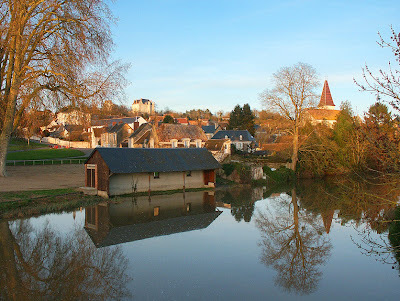 This is the "Pont Gallo-Romain" shown on the Michelin Map as just north of Loches. When you get there, it's a bridge, but no less impressive for that. Getting on for 2000 years old and still spanning a river, it isn't a bad piece of engineering. In a previous life, our house was a grain merchant's. The barn was converted into a grain store, mainly by adding a massive amount of extra beams and bracing. 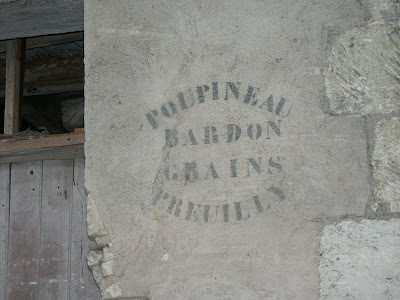 In a couple of places on the outside wall of the house there is a stencil, which we assume was meant to be applied to hessian sacks of grain. When we re-render the walls we are hoping we can retain at least one of these stencils as a nod to the house's history. 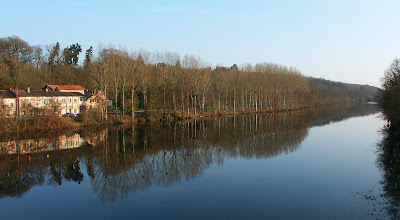 A view of Preuilly from across the river. The small building in front is the public laundry. It's hard to believe, but this photo was taken in the middle of February. 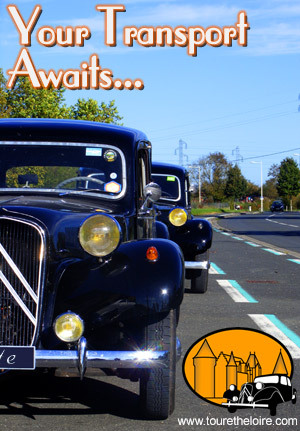 Pleumartin is about 20km from Preuilly, and we travel through it every time we go to Poitiers. We have never seen the market here, so we don't even know if the covered market is used. It is very impressive, though. Today in the post we received all the paperwork for the car transfer and our cheque back in the post. It appears (I hope) that the person dealing with our paperwork in Tours has grabbed the wrong end of the stick and has started running. What the letter is saying is that we need to complete all the paperwork needed to import the car into France. As the car is already registered in France, this would mean exporting it to the UK, doing all the changes necessary to make it comply to UK standards and then register it. We would then have to export the car from the UK to France, undo all the the changes done so that it can be registered in France again. This appears unnecessarily complicated and costly. I hope a polite letter will solve this, as we have now passed our 1 month limit for doing this transaction. 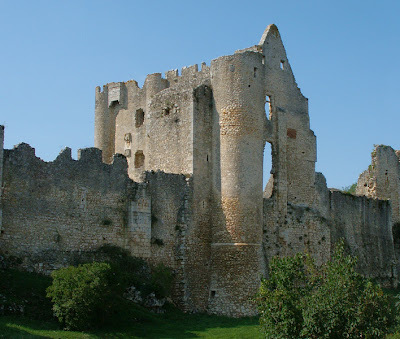 La Guerche is about 10 Km from Preuilly sur Claise, and has a lovely small chateau. 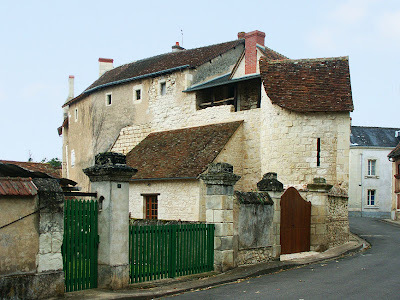 These houses appear to have been built into one of the outer walls of the chateau. The chateau itself is about 100 metres further on the right. 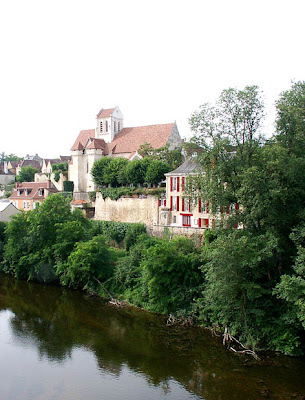 Montrésor is regularly promoted as "one of the most beautiful villages on France". 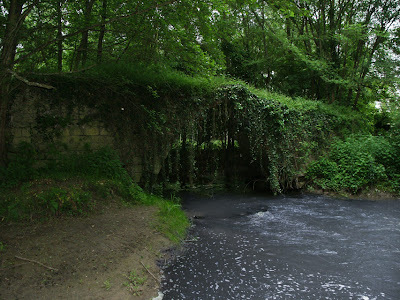 It has a network of walking trails through the water meadows which give some great views of the chateau. This photo was taken looking up the main street.